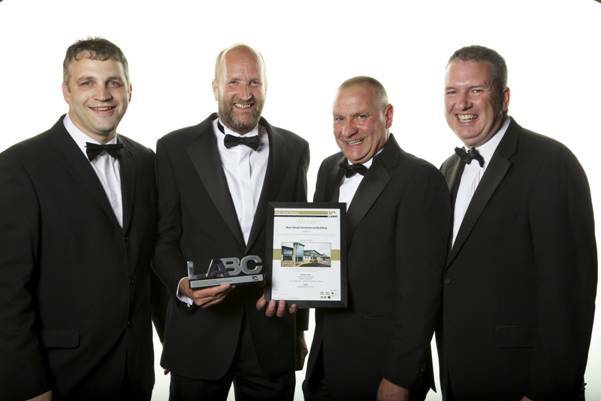 Our project in Tebay constructed for Lyon Equipment was a winner at the Northern LABC Building Excellence Awards. The new offices and warehouse facilities were voted the “Best Small Commercial Building” at the event held at the Gateshead/Newcastle Hilton. The project will now be a contender in the national awards to be held in London later this year. Pictured left to right, Phil Ashall, Jonathan Capper (MD Lyon Equipment), Mike Beattie (Facilities Manager Lyon Equipment) and Michael Conlon.